Berlin, 22 February 2019 Berlin has strengthened its position as one Europe’s top three travel destinations. In 2018, approx. 13.5 million people visited the city – an increase of 4.1% over 2017. The number of overnight stays rose by 5.5% to 32.9 million. Berlin is especially popular with international tourists with 5.4 million visitors from abroad (+5.9%) spending 15.1 million nights in the city (+7.9%). Overnight stays by visitors from within Europe are the main driver of growth. After showing signs of slowing in 2017, this figure rose by 9.3% in 2018. Despite the impending Brexit, most international visitors came from the UK, which accounted for 1.7 million overnight stays (+1.6%). This was followed by the USA at 1.3 million nights (+5%) and Spain at 1.03 million (+18.3%). On average, international guests spend 2.8 days in the city, a slight increase over the previous year (2.7 days). Visitors from within Germany continue to account for the largest share of the total overnight stays. In 2018, this figure rose to 54.1%, an increase of 3.6%. In 2018, Berlin’s meetings and conventions industry also further consolidated its leading position in this sector. The city hosted around 143,390 events attended by approx. 12 million participants. For the first time, the meetings and conventions sector generated over eight million nights in Berlin hotels. Events in this sector showed an increase of 2.3% over 2017, with a 2% rise both in the numbers of participants and overnight stays. In 2018, the Berlin meetings and conventions sector generated total sales of €2.63 billion (2017: €2.51 billion). With Berlin’s event industry providing a total of 44,100 full time jobs in statistical terms (2017: 43,200), this sector is an important economic factor for Berlin. For the last five years, in a comparison of international congress cities Berlin has been ranked among the top 5 destinations behind Barcelona, Paris and Vienna. 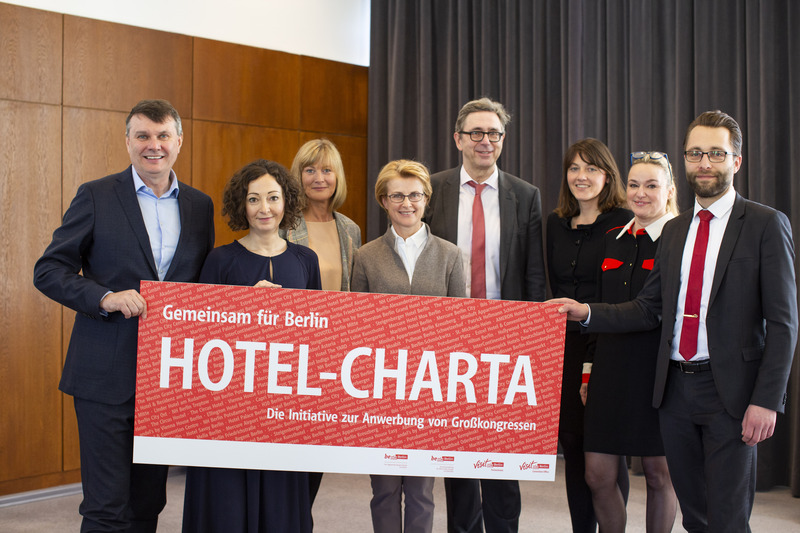 The new Hotel Charter is designed to further strengthen Berlin’s position in the international meetings and conventions sector. The Hotel Charter is an initiative to attract new large international congresses to the city. It provides exclusive services for organisers of congresses with over 1500 participants and lasting at least two days. At present, the Hotel Charter has attracted 96 participating hotels with a total of over 51,000 beds – around 40% of Berlin’s total volume. The Hotel Charter represents a commitment to the entire city. It has been launched by the visitBerlin Berlin Convention Office together with the visitBerlin Partner Hotels Association and the Senate Department for Economics, Energy and Public Enterprises. In 2018, visitBerlin was active at 230 events in 40 countries promoting Berlin as an attractive tourism and congress destination. Over the past year, the six Berlin Tourist Info Centres advised around 1.8 million visitors. visitBerlin manages the Facebook channel “Berlin – the place to be” with 1.69 million followers, one of the largest city accounts worldwide.